Croatia is a perfect place to relax. If you feel tired of the cities or just feel curious, in Croatia you will have a choice to easily change your location. In a couple of hours, by car or bus, you can be in a perfect setting surrounded by nature, authentic village houses and some great food. We are talking about perfect weekend getaways that can be planned out really easily. So, all of you travelers, explorers and wanderers with restless feet, this series is for you. Here is part 1. 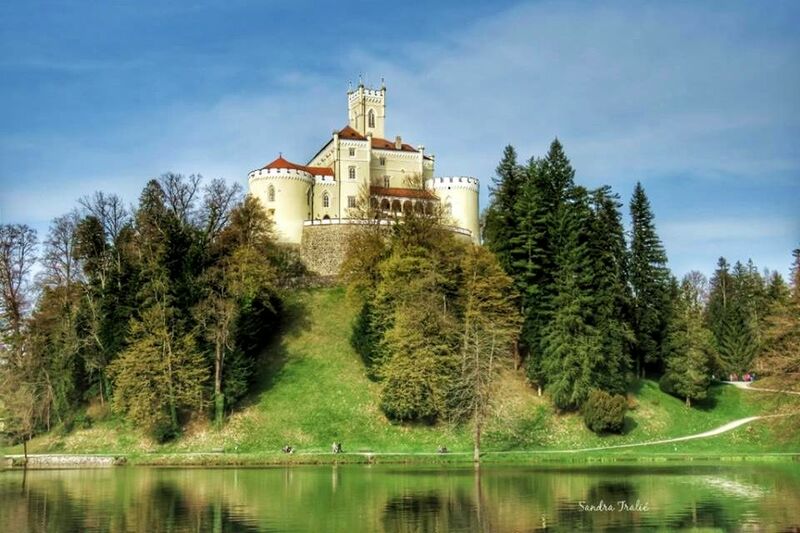 A castle surrounded by a forest park and a lake sounds like a really romantic getaway, and it’s located only 80km from Zagreb. This is an amazing cultural heritage, often called “one the nicest history gems in Croatia”. Couple years ago this medieval castle was renovated and since then it attracts lots of visitors who enjoy its old historic tales, myths, exhibitions on three floors and its rich collections. shared the fate of their other towns and estates that were divided and changing owners. From 1584. year it belonged to Drašković family, one of the best known in Croatian history. In the boom years of building castles in Croatian Zagorje, in the second half of the 18th century, Trakošćan was abandoned. Neglected, it began to deteriorate rapidly so just in the second half of the 19th century, the family re-interested in its estate in the spirit of the new era romantic return to nature and family traditions. In this spirit, Marshal Juraj V. Drašković in the residential castle and the surrounding park was transformed into a romantic garden. The next generations occasionally stayed in Trakošćan until 1944th when they immigrated to Austria soon after the castle was nationalized. In 1954 the museum was established with a permanent exhibition and today the castle is owned by the Republic of Croatia and it is still beautiful. Trakošćan is one of the few facilities in Croatia with preserved its own constitution, historically closely related to the architectural framework and the life of its owner respecting Drašković family. The museum has a valuable museum material from the Renaissance period to historicism, which is divided into several collections: a weapon collection, collection of paintings and prints, a collection of furniture, a collection of books and a collection of photographs. So here you will really soak up some great historical atmosphere. Around the castle, you have plenty of accommodation while during the day you can wander in and out this architectural beauty. Another romantic idea for a weekend trip, but in another authentic way! 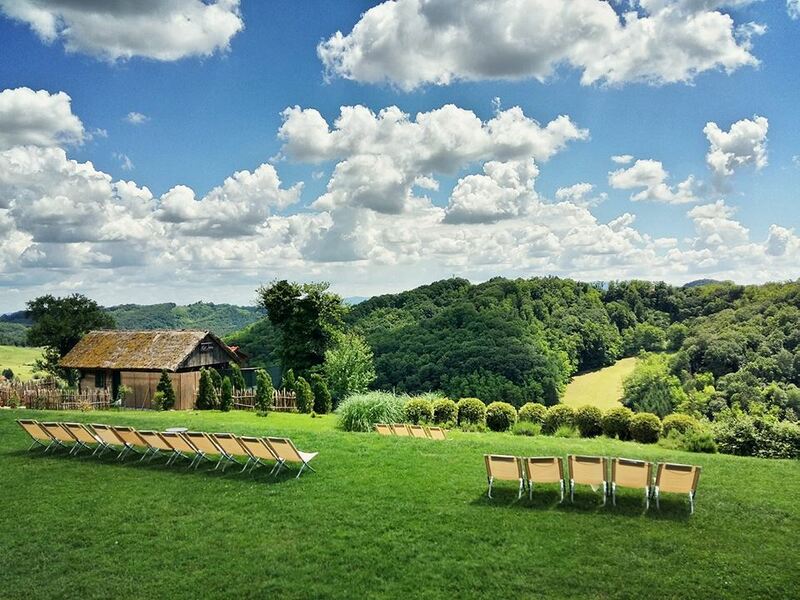 The tourist village ‘Vuglec Breg is 40km away from Zagreb, located in the heart of Zagorje, between beautiful green hills. 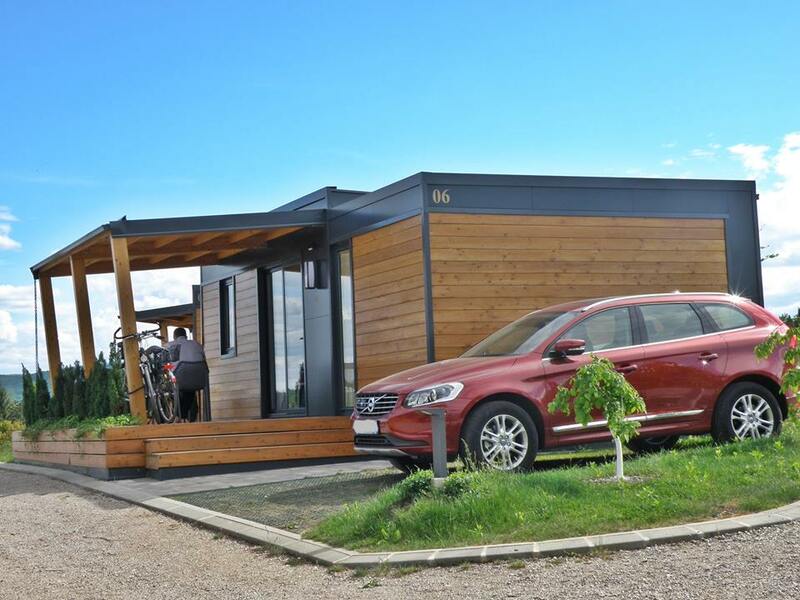 The Vuglec family’s aim was to convert the heritage of their ancestors into a lasting value and that is how they have created this little piece of heaven – winery, pansion, and restaurant. 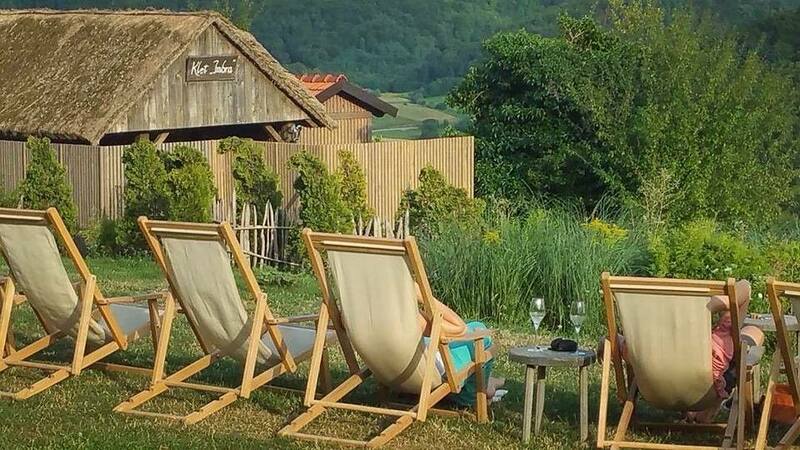 In this charming authentic corner of Zagorje they like to say how Vuglec Breg was created on the foundations of the old Zagorje hamlet of ”Vuglec” and also on life-experience and traditions of rural existence in Hrvatsko Zagorje, where healthy lifestyle was the norm until the 1970s. The estate stretches over an area of 12 hectares and from the peak of the hill, which is at about 300 meters above sea level one can enjoy a magnificent view of the surrounding hills dotted with houses, cottages, and churches. The land was renovated and a number of autochthonous houses, in Croatian called ‘hiža’, were converted into accommodation for tourists, an old building which holds the restaurant, a wine cellar, and a seminar hall. Right by the restaurant and along the first vineyard rows there is a pergola with a BBQ, a bread oven, and a summer terrace. On the northern side of Vuglec Breg there is a horse barn, a little pond, two tennis courts and two ‘five a side’ football fields, a playground for children, lawns and walking paths. 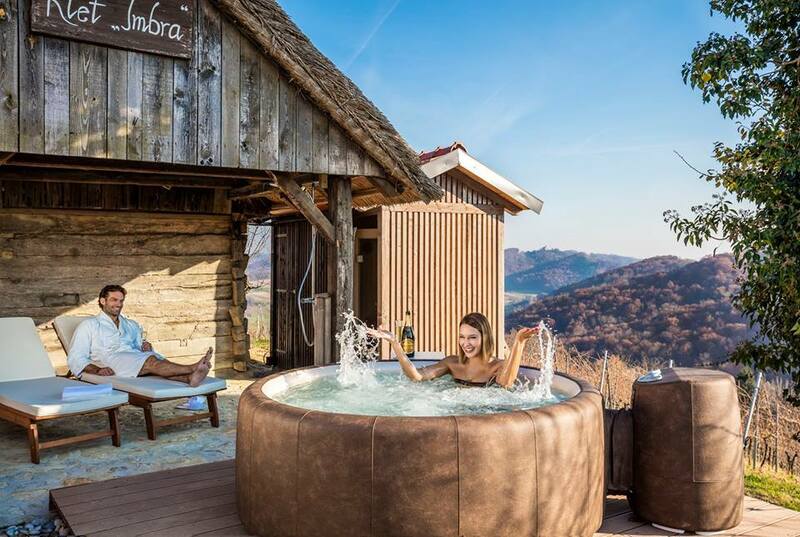 You will find this place as a perfect spot to relax and enjoy great food and wine but to be honest there are plenty of reasons here to spend an active weekend vacation. You can ride bikes through nearby mountains and fields, you can play tennis as well as football, badminton or volleyball – there is a court for everything. At the inflow of the river Slunjčica into Korana, nature played a game and created a magic that is often called „an introduction to Plitvice“. 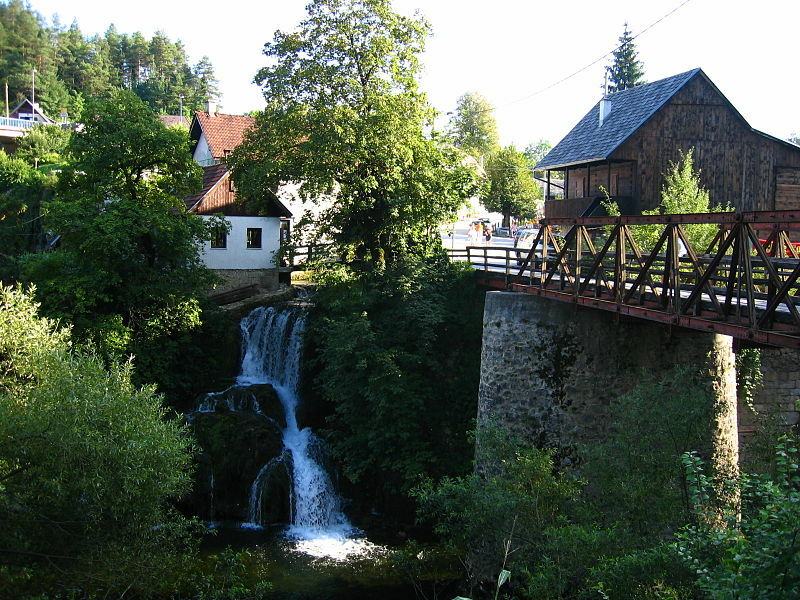 The beautiful village of Rastoke is located on the limestone rocks close to the Buk, Hrvoje and Vilina kosa waterfalls. 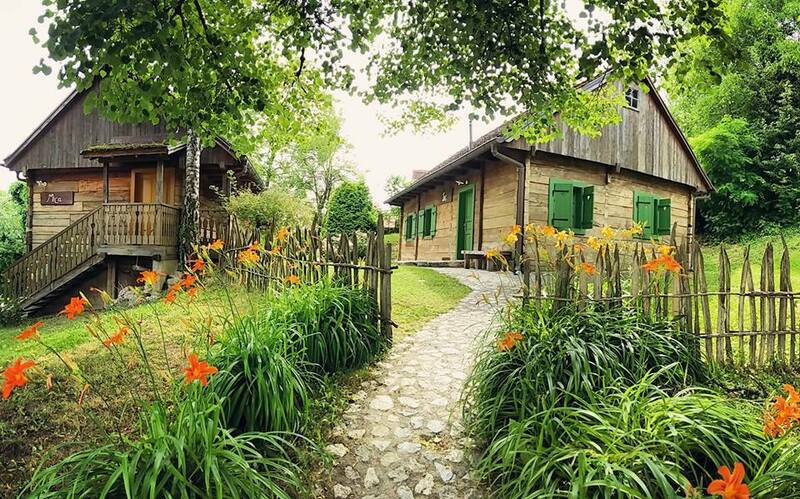 The first houses in this magnificent natural environment were built around three hundred years ago, and this harmony of nature and man was included in the registry of cultural monuments of the Regional Institute for cultural protection in Zagreb in 1969. 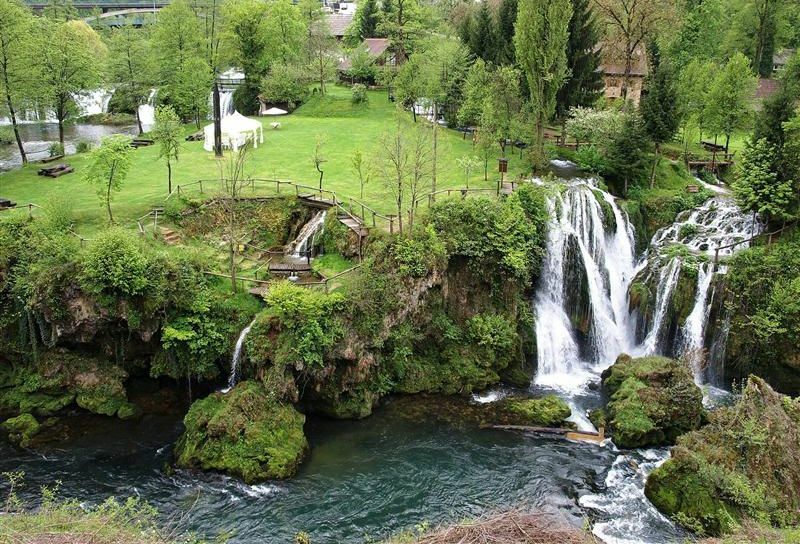 The traditional wooden architecture, immersed in waterfalls, is something worthwhile visiting! Here you will have a feeling you want to stay forever locked in this natural fairytale. 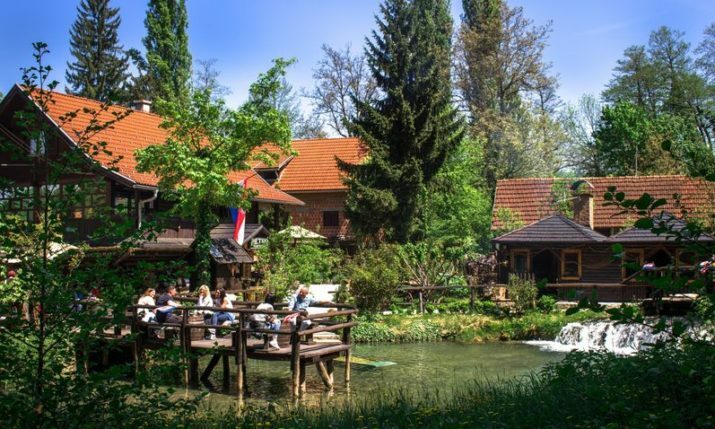 It is an hour and a half drive from Zagreb, and 8km from the national park Plitvice, which is probably great next stop from here. You can find different types of accommodation in this village and around; rooms, camp houses, mobile homes, apartments, little Indian village, but if you ask us the most charming place to stay is in a wooden bungalow just on the waterfall in the middle of the village Rastoke. During the day you can walk around the village, explore domestic delicious food and authentic Croatian lifestyle like it was once. Cause here, everything looks like in the past times, actually, they like to say how the time stopped here! And it will stop you from hurry and stress for sure.